Spectators were treated to an exciting weekend of table tennis action as the annual national championships took place across the European continent. There were first time winners in France and Germany, shock victories in Greece and Belarus - and more. Here's an overview of how the weekend's action unfolded. We start our round-up in Rouen where the 2018 French National Championships were held. Yuan Jia Nan lifted the Women’s Singles trophy for the fourth occasion with a narrow win against another four-time champion Carole Grundisch (3-11, 9-11, 11-5, 11-8, 7-11, 11-8, 11-9). There was a first title in the Men’s Singles tournament for Alexandre Robinot, who improved on his silver medal finish from last year with a five games victory over surprise finalist Enzo Angles (11-6, 16-14, 9-11, 11-6, 11-8). There was more success for Alexandre Robinot in the Men’s Doubles category, partnering up with Joe Seyfried to beat Romain Lorentz and Brice Ollivier by a three games to nil scoreline (11-9, 11-8, 11-8), with the Women’s Doubles crown going to Oceane Guisnel and Stéphanie Loeuillette. Timo Boll and Han Ying celebrated title wins at the 2018 German National Championships, while spectators in Berlin also witnessed new champions being crowned in the doubles events. Collecting his 12th Men’s Singles gold medal, Timo Boll accounted for Killian Ort in the final (11-5, 11-8, 11-4, 11-5). For Han Ying it was a first Women’s Singles trophy at the Nationals. Coming out on top against Tanja Krämer in a thrilling encounter (11-5, 11-4, 10-12, 10-12, 12-10, 11-9), Han Ying was understandably beaming with joy after the match. Qiu Dang and Huong Do Thi added their names to the list of doubles winners at the tournament after pairing up with Benedikt Duda and Sabine Winter to prevail in the Men’s Doubles and Women’s Doubles competitions for the first time. Disappointment at the last hurdle in 2017, but at the 2018 Italian National Championships in Terni it was a story of success for Niagol Stoyanov in the Men’s Singles final. The full match distance was required as Niagol Stoyanov defeated Leonardo Mutti (11-6, 3-11, 10-12, 11-5, 11-4, 9-11, 11-8) to win the title for the second occasion. 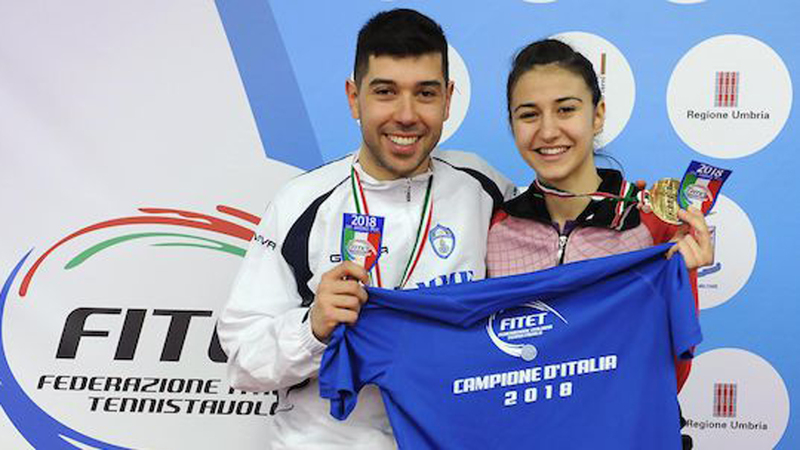 Giorgia Piccolin took the plaudits in the Women’s Singles gold medal contest for the first time, with 15-year-old opponent Jamila Laurenti losing out in six games (11-3, 13-11, 8-11, 11-5, 5-11, 11-5). Liam Pitchford and Tin-Tin Ho impressed at the Copper Box Arena, emerging victorious over Sam Walker (8-11, 11-4, 11-4, 11-9, 11-6) and Kelly Sibley (6-11, 11-8, 12-10, 11-8, 11-8) at the 2018 PG Mutual English National Championships while over in the Czech capital of Prague the Men’s Singles and Women’s Singles were awarded to Pavel Sirucek and Hana Matelova respectively. The triple crown was once again sealed by Sofia Polcanova at the 2018 Austrian National Championships as the 23-year-old star achieved title victories in the Women’s Singles, Women’s Doubles and Mixed Doubles tournaments. Daniel Habesohn secured the Men’s Singles gold medal for the third time in his career with a superb outing against Stefan Fegerl (11-9, 12-10, 11-8, 11-13, 11-4). 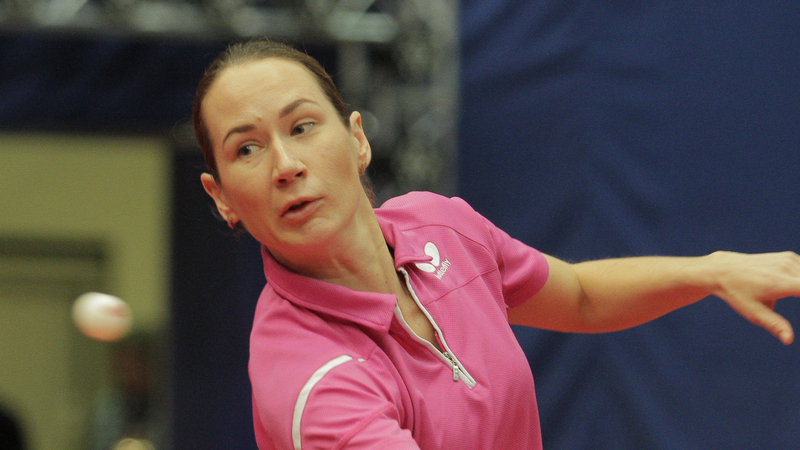 In Denmark it was Anders Lind and Stefanie Christensen who lifted the singles trophies, with Ovidiu Ionescu and Irina Ciobanu achieving the same in Romania. Penza played host to this year’s Russian National Championships where Alexander Shibaev and Polina Mikhailova took the honours in the respective Men’s Singles and Women’s Singles events with five games victories over Vildan Gadiev (11-5, 11-6, 9-11, 11-7, 11-5) and Olga Vorobeva (11-13, 11-5, 11-9, 11-7, 11-3). Jakub Dyjas and Natalia Bajor came away with the Men’s Singles and Women’s Singles trophies in Poland for the first time with Cedric Nuytinck and Lisa Lung picking up the equivalent at the Belgian National Championships. In Greece there was a first national Men’s Singles gold medal for Konstantinos Konstantinopoulos, who dethroned defending champion Tasos Riniotis (12-10, 10-12, 6-11, 11-7, 11-6, 11-2) while there was another major shock in Belarus with Marharyta Baltushite outclassing top seed Viktoria Pavlovich (15-13, 12-10, 4-11, 11-8, 6-11, 11-13, 11-7). Ewout Oostwouder and Shuo Han Men were the two senior players to come away with singles gold medals at the National Championships in the Netherlands and over in Croatia it was Andrej Gacina and Petra Petek who claimed the singles titles.